i realize i am just on the cusp of tomato, peach and blueberry season being over. 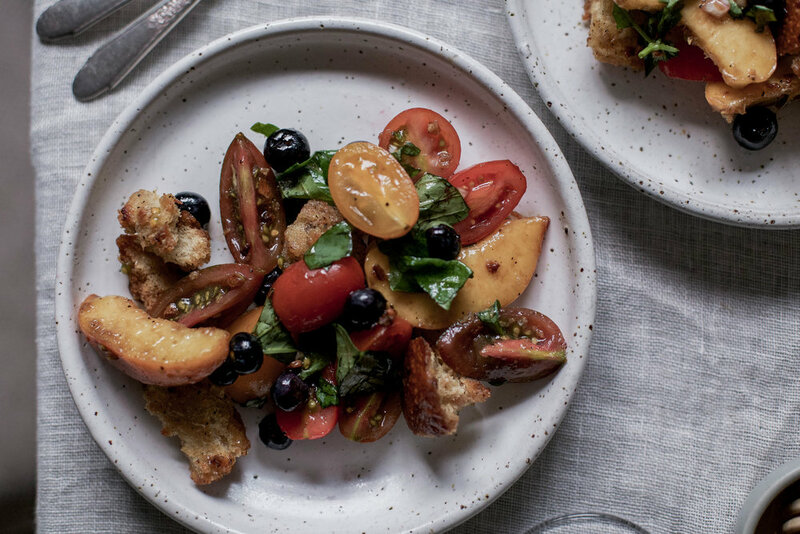 i had intended for this panzanella salad to be up a couple of weeks ago but somehow this september has grown it's own set of wings and completely taken off on me. it's all exciting, it's all good, wonderful really, these things i have going on behind the scenes (hope to be shared soon), but nonetheless they have kept me on my tippy toes flying around. which has meant i have not been able to be as present as i may have wished in this here space of mine. to be honest this busyness may take over my life for the coming months but i do promise to pop in here at least once a month with some kind of delicious update...like this panzanella salad. if there was one salad i could eat for the rest of my life it would be this salad. it represents all the beautiful elements of the end of summer and flawlessly leads us into the cooler autumn months. the flavours are simple as is the prep but once they are tossed together it is like heaven on a plate. my biggest pet peeve with panzanella salad's is mushy bread, i mean, who ever really wants mushy bread panzanella salad or not. but i wanted to make sure these croutons could stand the test of time. so i started with fresh bread, yup fresh, not day old, not two day old, not three day old, fresh soft, squishy bread. using fresh bread really allows you to determine the kind of crunch you want. personally i like it when a crouton is a little larger (think 1 inch in size), has a crispy outside but a tender soft inside. it's the best of both worlds really. the fresh bread is torn into pieces, somewhat dehydrated in the oven on a very low temp, then tossed in butter, garlic & olive oil that the toasted bread just soaks up. finally the flavoured croutons are placed back into the oven at a very high temp to get that second layer of crisp. they are highly delightful and really quite easy to make. you could make a larger batch and save some for later salads, caesar maybe or just eat them by the handful. roughly tear the sourdough into 1 inch pieces. you don't want the pieces too small nor too large. place the fresh bread onto a baking sheet and into the oven for 30-40 minutes until it has semi-dried out. the outside will feel slightly crispy but still tender to the touch (a squishy middle). in a large sauce pan on low-med heat add about 2 tbsp of olive oil and 3 tbsp of butter. mince the garlic and add it to the pan to brown a little. throw in the dehydrated bread, coat evenly and season with salt and pepper. place the croutons back onto a baking sheet lined with parchment paper and into the oven for another 15-20 minutes. watch this step very closely as the croutons will burn quickly. you just want to brown them, again the outside will be crispy and the inside will still have a slight squish to it. trust me the crisp with the squish is delicious. the rest of the salad is quite simple. finely chop a shallot, slice a couple of peaches, cut the tomatoes in half, add everything including the blueberries and basil to a large bowl and toss together with a drizzle of honey (about 1 tbsp) and some olive oil and balsamic vinegar (a couple of tbsp of each, use your discretion here). finally add the crispy croutons and toss once more, making sure to coat the croutons with some of the olive oil and balsamic vinegar juices. serve immediately. these croutons because they are larger and crisped twice will hold their structure much longer than regular croutons but not more than one seating (aka you can't leave this salad overnight). ratatouille or provencal tian? that is the question...whatever you call it this recipe is a keeper!